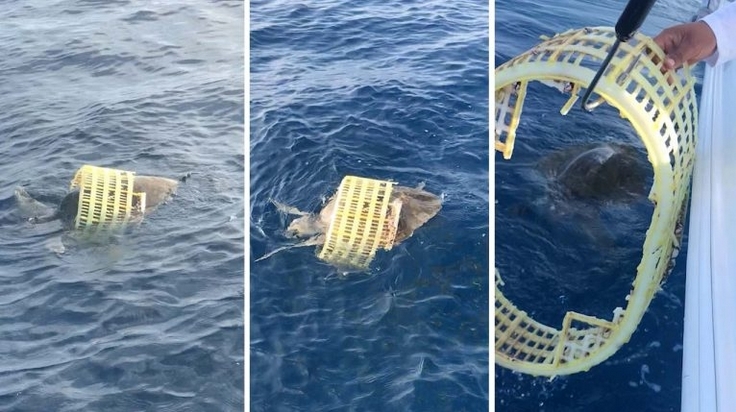 Professional marine artist Carey Chen, 52, spotted the sea creature struggling inside the yellow basket whilst completing in a charity fishing tournament at Casa Vieja Lodge in Guatemala earlier this month. In her footage, friends Danilo Carmeno and Ridge Murphy can be seen freeing the animal from the basket. Carey said: “I saw the yellow basket in the distance which was moving, so I told the captain to turn back. The plastic can impact Carey’s work, which as a result makes the lodge a more appealing place to complete projects she has. Carey explained she sees more and more plastic in the ocean – while Casa Vieja promotes a no-plastic bottle rule, as instead they have visitors fill up thermos’ before heading out to fish. Hundreds of thousands of sea turtles, whales, and other marine mammals, and more than 1 million seabirds die each year from ocean pollution and ingestion or entanglement in marine debris. Marine debris is manmade waste that is directly or indirectly disposed of in oceans, rivers, and other waterways. Most trash reaches the seas via rivers, and 80% originates from landfills and other urban sources. This waste, which is also consumed by fish and can entangle sharks and damage coral reefs, tends to accumulate in gyres (areas of slow spiraling water and low winds) and along coastlines. Responses to "Fishermen to the rescue! Trapped sea turtle freed from plastic"